Cook your favorite meals without electricity using this innovative bag that benefits families in Africa. Conserve energy and precious time cooking your favorite meals with this innovative bag that needs no plug, fuel, or battery. Handmade by artisans in South Africa, the slow cooker is packed with repurposed foam that either insulates or chills food while you're at work or spending time in the great outdoors. Simply bring your food to a boil, let it simmer, and then pack it inside to let it cook unsupervised for hours. For every large blue bag bought, the makers donate one to a family in Africa, where cooking is not as simple as a trip to Trader Joe's, some prep, and an hour in the oven. In fact, there aren't ovens, and making a meal means braving a dangerous route to collect firewood or spending a third of your income on charcoal. A beautiful blend of environmental and social advancement, the design is a safe, simple alternative to traditional electric cookers, and it helps feed and employ the women who inspired it. Click here to learn how to use your Non Electric Cooker to make Eggplant Parmesan, and visit the blog to learn more about how the Non Electric Slow Cooker is helping change lives in Africa. Wipe clean with a damp cloth and air dry. Alternatively, the bag can be washed on a gentle cycle and hung to dry. Large Blue: 16" diameter x 7" H; 2.68 lbs. Small Red: 12.5" diameter x 4.5" H; 1.6 lbs. Loved this gift for a teacher and a mom of 2 young girls. They love to cook together, but are very busy. And Mom gets to teach them about supporting women in other parts of the world, something that's very important to her. We have had this for almost 1 month and used it on 4 occasions. It is great just as advertised bring food to a boil and remove from stove top. 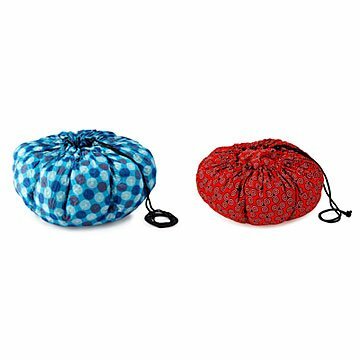 You then very easily just place pot into the Wonderbag , tighten the drawstring place the top on and walk away. Come back after a few hours your food is cooked to a pull apart tenderness without any scorching or burning that can occur over a long time of slow cooking on a stove top. We have not used it outside our home but we already see the possibilities. Also the recipe book included is very useful and a nice extra. Just bought 2 more for my wife's two sisters.